Hushcon 2016 badges were these amazing Wifi pagers designed by whitey. They were "some assembly required" -- most of the surface mount parts had been installed, but the con goers had to solder on the buttons, motor, and through-hole pins on the esp8266 module, as well as assemble the kits. They also didn't have any software, so I spent part of the day writing it. My Source code for sample Arduino sketches: github/osresearch/hushcon. The ESP8266 is wired to the ATmega328p via software serial port, but we've seen lots of serial bit errors at 115200 baud, so it worked better if we wired two jumpers from the AVR's hardware serial port (pins 2 and 3 on the programming header) to the ESP's port (pins 3 and 2 -- note the swap). WiFi operation - Done! The hushcon/hushcon.ino example joins the access point and fetches a page over http (not https). Twitter notifications and DMs - Not done! Twitter now requires oauth and https, so it would require SSL. Design a board to fit in the Bravo pager? 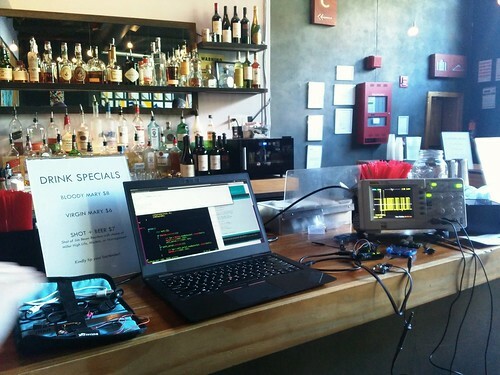 The code was written in the bar at Littlefield, so the quality isn't great and we didn't the best tools. It needs a lot of cleanup, improvements in robustness and actual processing on the HTTP results. The major software that needs to be written to make these super useful at a con is a base-station that allows the organizers to register pagers and send them alerts. The pagers could have a UUID generated when they were flashed and monitor the network for packets addressed to them, as well as an all-call address to announce when new talks or events were coming up. This would require an infrastructure network at the site that they can join with pre-programmed credentials. This page was last edited on 26 June 2016, at 13:41.